Have you found an online vendor selling Siesta Key Toasted Coconut? I'm going H.A.M.! Hot damn, this is good. First tasted this at the 2016 Miami RumFest. I quickly tracked it down at Total Wine and bought two bottles. This rum, which is 70 proof, actually has a toasted coconut flavor (as labeled) with a nice rich rum taste at the forefront. It is not overly sweet and can be enjoyed on its own, but is a champ in tropical drinks. I'm sure this will become widely available due it's great flavor. Incredibly underrated, probably due to rarity. This casts a long dark shadow over any other rum posing as coconut flavored. This is one of the better coconut rums I've tried, and I've tried a lot. So why a 6? Because it's a flavored rum, which I don't like nearly as much as aged rums. Still, I scored this higher than most of the other coconut rums I've tried. As of this review, my favorite coconut rum is the Koloa Kaua'i Coconut. Tastes of toasted coconut, spice, vanilla, honey, and pie crust. Dumping flavors into young spirits is one of my biggest pet peeves. If you're a small upstart, of course you need time to age and perfect your product. But all the rums I've had from Siesta Key felt phoned in and shortcut. A good white/silver rum or blend is a fine way to start. Going for the low hanging fruit with flavored rums for people who don't know or care about the differences is a huge turnoff. 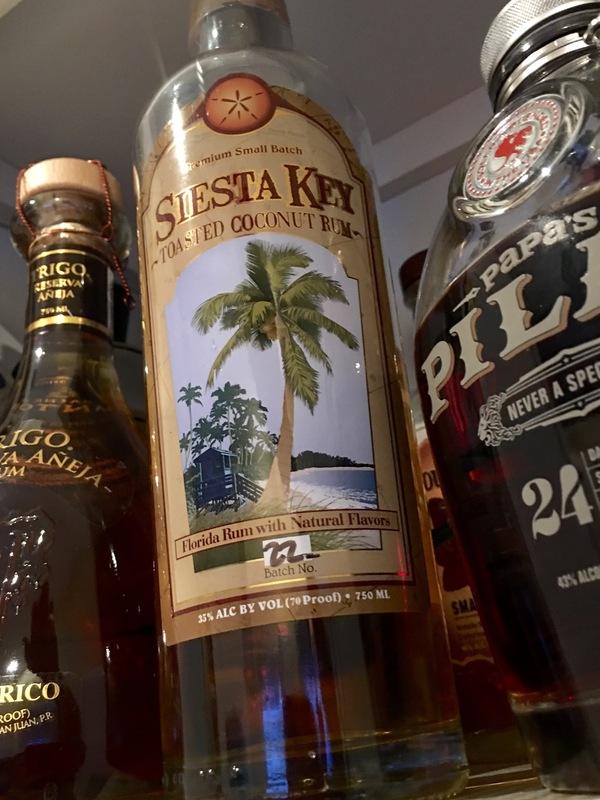 My hope is the folks at Siesta Kay have some rum packed away in casks and in 8 to 10 years we'll see some more refined and crafted rums, and the winecoolerish candy sweet syrup rums will go away. This is an excellent rum to sip if you like the taste of toasted coconut. i am not sure it would hold up well in fruity tropical drinks as it is probably not assertive enough. But why would you want to when it is sooo good on its own? This stuff is positively delicious. It's a flavored rum, but without any sickening sweetness or questionable additives. The toasted coconut flavor is positvely resplendent with soft, buttery tones and genuinely rich, fruity goodness. Available at Total Wine for $23. Elsewhere in a review I wrote a while back I proclaimed Koloa Coconut to be the best coconut rum. Now it's tied for first with Siesta Key Toasted Coconut rum. First off, it was tough trying to track down a bottle in the first place. I had read how good this rum is online and decided to try it but no one for a while could get a bottle. I emailed the company back in November, 2015 and it turned out the demand was so high that they just ran out and wouldn't get more out the door until February, 2016. This rum has gotten very popular. Eventually I got a bottle to try. The folks at Siesta Key have another absolute winner. First it is a beautiful straw/light gold color. Swirling it in my snifter reveals good long legs as well as a good cling to the wall of the glass only to slowly slide to the bottom. The fragrance is also absolutely outstanding. None of that cloyingly sweet artificial coconut smell most cheap rum emit. Rather this smells like toasted coconut mixed in with a noticeable sugar cane aroma. Very nice. The flavor is exceedingly nice. Definitely sweet with vanilla undertones to go with the toasted coconut but none of that cloyingly/sickenly sweet stuff the cheap rums offer. No significant burn. A nice warmth from the 70 proof rum. Not sure if it is aged in oak barrels but there is really is little, if any, oakiness present. Very smooth. Now if you want a massive coconut flavor along with alcohol in your tropical drink get the cheap stuff. 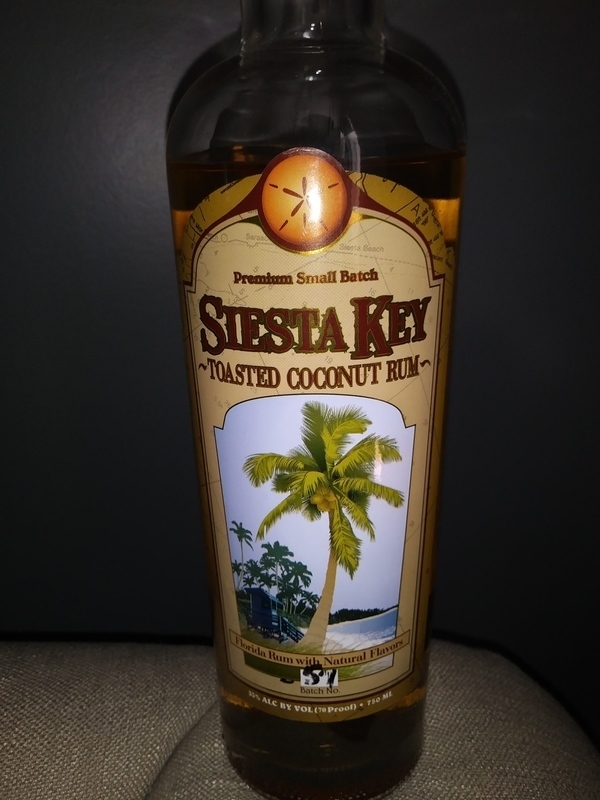 But if you want a coconut rum worthy of sipping neat then Siesta Key Toasted Coconut is one of only two coconut rums I would recommend (see first paragraph above for the other). The good folks at Siesta Key rums are doing things right in that part of Florida and word is getting out at how good their rums are. Their products will spread and demand will continue to increase. I expect good things for them. A friend of mine brought this bottle back from Florida for me since it is unavailable in my state. Having tried and rated the spiced offering from Siesta and reading the reviews on this one I was excited to try it. First off, I am a big coconut fan, so I knew I would like it. I tried it first neat, then with I cube of ice. The toasted coconut flavor is subtle and fantastic. This has smooth character and great flavor. Overall I preferred it with 1 ice cube just to settle down how sweet the rum is. This is the best coconut flavored rum I have come across. Too bad I can’t get it here because the bottle is almost empty. This is a fantastic rum for tropical drinks. It adds a smooth coconut flavor to the drinks that makes one think he is on a tropical island. Best of all, for me anyway, is that the distillery is in Florida. This is a different type of coconut rum as it's flavoured with toasted coconut instead of just sugar. It's still pretty sweet with sugar but an awesome rum, sadly only available in America . This makes a great cocktail for the price and adds a different dimension to a Cuba libre . picked up this rum in my local shop, because it was a Florida Rum. Really enjoy the taste, not to sweet, just right. Visited the distillery in Sarasota and found out rightfully so, that this rum takes top prizes year after year. Agreed with the experts! Strong and complex, perfect to mix with anything: soda, fruit juices. Makes an incredible rum runner and rum punch, and pairs well with Siesta Key Spiiced. My go-to rum and worth every bit of the $23-25. There are a lot of coconut rums out there, and when mixed with fruit punch, they all go down fine. But here is a coconut rum you could even drink neat. On the nose you get a hint of coconut, but also smell the rum. The first sip has a bit of an oily mouth feel, but it fills your mouth with a sweet coconut milk flavor, followed by toasted marshmallow and nutmeg. It’s very sweet and heavy coconut flavor. Reminds you of a Caribbean sunset sipping rum from a coconut. I really enjoy this rum and the this rum brand. Great price and good rum! The coconut is just right, and the butter/butterscotch finish seals the deal. One of my personal top three rums. For those who don't care much for the taste of coconut and want a subdued coconut flavor to qualify as being a tropical drink, this one should fit your bill. I personally prefer the more pronounced coconut flavor and higher proof of the Koloa version, which I also consider worthy of paying another $10 for (see my review on that one). The flavors on this one are subdued coconut and honey. It can be sipped neat, on the rocks, or in exotic tropical drinks. Update a few days later: The honey obliterates the wonderful taste of tropical coconut, so I now dock it one point. Caramel color... can kinda taste the alcohol more than i expected. What an amazing experience the Siesta Key Toasted Coconut was. Locally produced in Florida, easily available from most liquor stores at around $25 per bottle. Such an unbelievable coconut flavor and nose test. All real ingredients, nothing artificial. Smooth taste test and a very pleasurable long lasting coconut flavor at the end. Maybe a tad of butterscotch flavor, but its quite mild. Very well done indeed! The flavor of the coconut really comes through in this due to it being toasted. This is refreshing to sip on and mixes well in a pina colada or even added to a pain killer. This would be good in a tropical cocktail (like a pina colada) or with a fruit juice. This a great priced and very flavorful rum for the pre party festivities, or just sitting around on a sunday. One of my favorites.